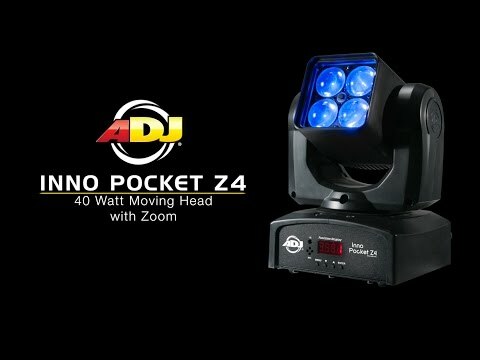 Considering purchasing the American DJ Inno Pocket Z4? Have questions? Ask people who've recently bought one. Do you own the American DJ Inno Pocket Z4? Why not write a review based on your experience with it. Very pleased with this little moving head wash. A pair of these fit perfectly in an F4 par bag. Faultless service again from Greg at DJkit. From the ADJ line this is by far my favourite fixture! The 10 to 60 degree zoom beam angle is incredibly useful. and the split colour beam effects this produces are absolutely stunning! For future plans I would like to extend my rig to 16 of this beauties and create some amazing flying rigs which I can pixel map! Seen a video for American DJ Inno Pocket Z4 online or have you own video? 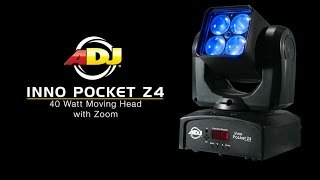 Check out American DJ Inno Pocket Z4 on DJkit.com!